Our “Meet a Pool Designer” series continues with an interview with Kyle Ritchey. Kyle is relatively new to the Barrington Pool team but is a tremendous asset and a knowlegeable source of information for customers looking to build a new pool or renovate their existing pool into the backyard oasis they have always dreamed of. I am in my second year at Barrington Pools and really enjoying my time with everyone and our clients. 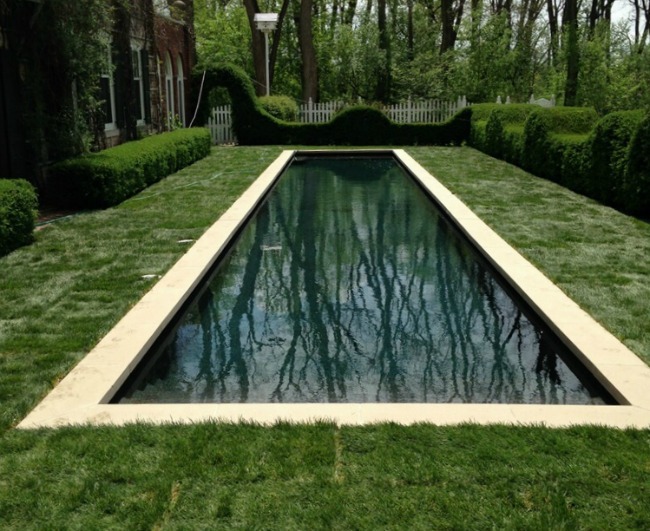 Before coming to Barrington Pools I was a lead landscape designer and construction manager for 10 years at a local landscape design & build firm. What is your favorite project and where is it located? I have many favorite projects, because we can do so many different and custom things here, but if I had to pick one right now it would have to be a project that we did at a historic home. The original parts of the home were designed, constructed, & lived in by a local architect in the mid-1900’s. Everything that the current residents have done in their decades of stewardship has been well thought out and pragmatic so that it all keeps the original design of the home & property in the evolving vision. One of the most challenging parts for our crews was the location itself – on top of a hill, 10 feet from the home, with existing boxwood hedges on all sides that couldn’t be disturbed – talk about being on point during the build! What is your favorite pool trend right now? My favorite pool trend for this year is actually something that can get overlooked until later on – the controls. Much like everything else in our lives, integrating your current smart phone or tablet with you pool controls is very popular and quickly becoming standard. The iAqualink application is easy to use and very intuitive. Lights, temperature, water features, spa control, in-floor cleaning systems – all in your existing iOS or Android device! With complete controllability comes ease of use & second-nature operation…all of that translates into no hassles and more enjoyment. You could be out in your front yard, decide to take a dip in the spa, access the spa mode on the phone in your pocket, and have that spa up to temperature by the time you and your family got dressed in your swim suits. Do you have a “dream pool” in mind? I would say that it ends up looking like a serene water hole – it is a naturalized pool with large boulders built into the walls & steps. It has a large water feature constantly pouring into the pool for great sound effect and ambiance – the feature would double as a jump rock too. It also has a tanning ledge for sunning and little ones to play & a few areas of benches so everyone can have a favorite spot to take it easy – a pool to grow with everyone in the family. What is the most important question someone should ask when considering building a pool? How will our family use the space? That question can drive everything – from the overall size & shape to sport accessoriesto lap swimming to water features to the amount and allocation of the decking spaces. 9 time out of 10 the form is going to follow the function. Of course we have the design skill and the construction expertise to come up with the very best vision incorporating everything into your property, but how one will use their pool should be right up front in the conversation. When not at work I am spending time with my wife and our 2 children. Swim lessons, baseball games, trips to the zoo, downtown excursions – all of it! When I am not with my immediate family, I am probably outside on a run, a bike ride, or planning my next wilderness camping trip with some friends. To learn more from Kyle and how he and the rest of the team at Barrington Pools can help you design your new dream pool, please contact us today.